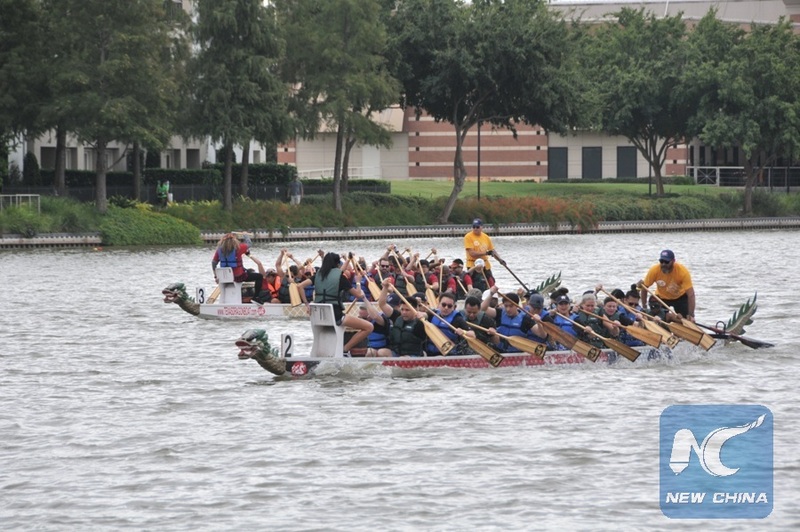 HOUSTON, Oct. 13 (Xinhua) -- The 15th annual Gulf Coast International Dragon Boat Regatta kicked off Saturday in Sugar Land in Southwest Houston, Texas, the United States, aiming to promote the tradition and share this aspect of Asian culture. Dragon boat paddlers and enthusiasts from all over the world came, with 12 teams participating in the event this year. Sugar Land Council Member Amy Mitchell said that the event helps celebrate the heritage and the hard work of Chinese people. "The purpose of it, in part, is to let people learn about it, understand it better," Mitchell said. "I think anytime we do things that share our cultures, it gives us a better understanding of different cultures. It improves our relations." Xie Fei, Chinese consul for cultural affairs in Houston, said that this traditional Chinese sport now has been spread to countries all over the world. "We are excited to see that Chinese culture can spread and be accepted by the local people," Xie said. "This is also a great example of promoting cultural exchanges between China and the United States. We hope that the dragon boat festival could continue to be held, contributing to mutual understanding and friendship between Chinese and American people. In fact, participating in the event also means a great way for people to exercise. Yu Meixiang, the vice president of Peking University Alumni Association of Houston, said, "I hope more people could come and join it. A lot of people usually don't spend much time exercising after work. And group activities could force you to exercise especially." The two-day annual event is expected to attract over 5,000 visitors, according to the Asian Chamber of Commerce in Houston. The Gulf Coast International Dragon Boat Regatta is organized by the Texas Dragon Boat Association, a non-profit organization, aiming to promote the tradition and art of dragon boating, increase awareness of Asian and Asian American culture and enhance cross-cultural understanding.